We had a really stellar first meeting for the Analog Media Party this month after Wordstock! It’s a publisher’s meetup group with the goals of forming both a regional publisher’s association and organizing an annual bookselling event! We identified some things we are interested in last time: networking, brainstorming, cover review, helping each other grow, developing the business end, meeting each other, venting/kveching (a new word for me), creating a supported industry, sharing resources, and eventually developing some clout. We envision a one day bookselling event partnered with a one day trade show with programming for publishers in Dec 2014. We’ll be having our second meeting at the Lucky Lab on 9th/Hawthorne on Nov 3 at 4 PM. 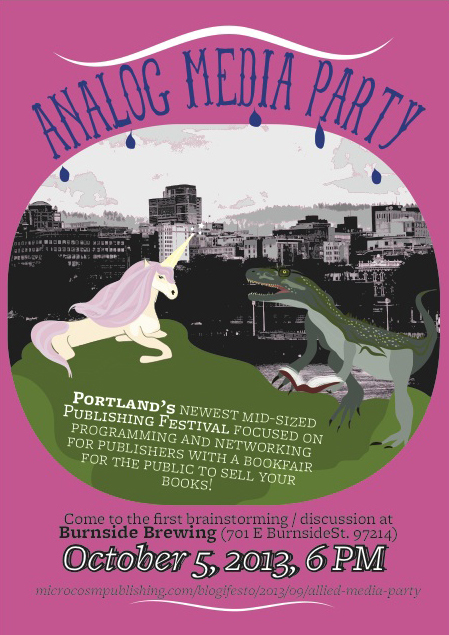 While other local festivals are extreme micro or focus on author services and promising big dreams with big publishers, the Analog Media Party is Portland’s newest mid-sized publishing festival focused on programming and networking for publishers with a bookfair for the public to sell your books! In the next installment of the greatest love story ever told, Glenn’s mother is still living with him and Henry, until Glenn runs away. Henry, John, and Darryl comb a dozen familiar LA institutions to reunite our lovers. After being reunited during a karaoke parody of one of Glenn’s songs, Henry & Glenn get their flu shots before the tragic events of Justin Hall’s (No Straight Lines) story of Henry & Glenn Go To Gaydes.” In this laugh-out-loud funny adventure many jokes are offered to longtime fans of our heroes and their musical pasts. Gaydes is, of course, ruled by Freddy Mercury who takes pity on Glenn and allows him one chance but he must never look back! Can Glenn do it? Will our lovers continue to frustrate, inspire, and show us the way? Additional art by Shaky Kane, Jeremy Owen, Beth Dean, Rafer Roberts, Grant Reynolds, and Alex Chiu. We were almost completely out of sweatshirts but just received the new Put the Fun Between Your Legs sweatshirts! They’re in 14 different colors. But here’s the catch: each size will be limited to 2 prints in each color. Get ’em while they’re hot (and it’s cold outside)! Conquerors of the largest land empire of all time, five times the size of Alexander The Great’s, Chingiis Kahn’s Mongol hordes were an unstoppable military might. In the twelth installment of J. Gerlach’s Simple History Series, he uncovers the great economics they created from China to Europe and how they continue to influence the world today. If you’ve ever wondered what it’s like to leave your hometown and follow your dreams, this book is both how-to and warning. Want to be an obscure comedy band? Now you can! The Bobby Joe Ebola Songbook features easy-to-learn lyrics and chords to over 90 songs by the infamous satiric duo, Bobby Joe Ebola and the Children MacNuggits, along with hilarious illustrations from Jason Chandler of Horrible Comics and over 40 more of the best illustrators from the art world, the comic book world and beyond. As longtime DIY artists, promoters, and organizers, Dan Abbott and Corbett Redford invite you into the bizarre world of Bobby Joe Ebola. With savage humor they dispense “helpful” rock’n’roll tips for making amazing things happen on little or no budget. From putting out your own record to organizing illegal concerts, from surviving a tour to plotting out on-stage gyrations, this miscellany is both an adventure tale and call to arms for every struggling artist. Tragicomic band trivia, esoteric pop quizzes, history lessons, and surprises on every page will make this your new favorite bathroom reading. Brutally honest, sidesplittingly funny, and strangely educational, The Bobby Joe Ebola Songbook can help artists and dreamers become doers and makers… if they can ever put it down. In collaboration with editor/illustrator Jason Chandler of Horrible Comics, the book also features scads of anecdotes, puzzles, essays, photographs, and other fun detritus from a stellar lineup of over 40 artists including Winston Smith, Dakota McFadzean, Jennie Cotterill, Mitch Clem, Cristy Road, Andy Warner, Keeli McCarthy, Petr Sorfa, Max Clotfelter, Jon Carling, Mike Foxall, Shielaugh Divelbiss, Richie Bucher, Ben Catmull, Eryc Why, Jason Novak and many more!